Fish Taco Chronicles is a quarterly print magazine that has been publishing since 1995. Co-founders Shawn Arnold and Leonard Davenport started the little “rag” more or less as a hobby. A way to go fishing and tell their wives they were working. Besides the traditional approach of telling readers how to catch a fish, their idea was to write about their own experiences…birds nest and all. If visiting a location Fish Taco Chronicles tells not only of the best fishing areas but perhaps the best place to find a cold one afterwards. Or the best ways to cook your fish after you have caught it. Their plan was a good one for a while until something they never expected happened…the magazine kept growing and growing and became work. Not that there are any complaints about it. Since the inception co-founder Davenport has passed away but Shawn Arnold had bought him out a few years earlier so the publication keeps on rolling. With some of the lowest print ad rates in the industry, Fish Taco Chronicles future looks bright. The magazine was called “offbeat” by former Orange County Register outdoor columnist Dave Strege, the magazine does tend to march to a different drummer than most outdoor magazines. In fact, legendary outdoor writer Jed Welsh wrote in a 2004 column that Fish Taco Chronicles is his favorite fishing magazine. I grew up in Lakewood, California honing my fishing skills on bluegill at Heartwell Park and bonito off the Seal Beach Jetty. Though I loved to fish as a youngster, I was a baseball junkie and did not have the time to fish as much as I would have liked to. In high school between games or leagues, I still found a way to get to Catalina about 10 times a year on an overnighter from one of our local landings. My hard work in baseball did pay off, as I received a baseball scholarship to Long Beach State. The time in college gave me the chance to hone my writing skills and prepare myself to work for my father who was in the publishing business. My father ran a machine tool trade publication and wanted me to join him. Soon after I went to work for him, we started a second machine tool publication called CNC-West. Having a steady income provided me the chance to pursue my passion — fishing. The publications sent me travelling a lot which gave me the chance to do some fishing in areas I would not have tried otherwise. My work travels enabled me to catch gar in Florida, pike in Michigan, walleye in Wisconsin, salmon in Oregon and Washington and brown trout in Argentina. This is in addition to all the local fresh and saltwater species that southern California has to offer. In 1995, I took the publishing skills that I had learned and partnered up with a friend to start Fish Taco Chronicles. That gave me a chance to put my working knowledge into the activity I crave — fishing. Fish Taco Chronicles is a quarterly magazine. The magazine has enabled me to fish and write about locations such as Costa Rica, East Cape Mexico, Mazatlan, Cabo San Lucas, Canada, Kenya and Alaska. I look forward to bringing readers of Fish Taco Chronicles in print and web my experiences and hope that you enjoy reading about them as much as I did writing about them. A magazine is only as good as it’s writers. Bill Schaefer – Based out of San Diego, Bill is a well-respected guide and seminar speaker. He is an expert in warm freshwater species and inshore saltwater species. Bill’s stories give good detail on how and where to catch fish. 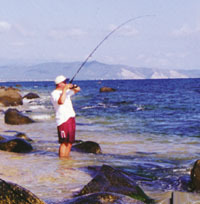 Bill Varney – Bill is considered a Surf Fishing Guru and has written one of the most well know surf fishing books ever. He also has a website www.fishthesurf.com that gives weekly surf fishing conditions and tips. Bill has an article in every issue. Scott L. Williamson – Scott writes the popular “On the Fly” column. Although based on fly-fishing, Scott deals with his experiences while fishing more that fishing itself. Scott is an accomplished actor who has appeared in such films as Fire Birds, Hook, Best in Show, A Mighty Wind and Waiting for Guffman. Scott also had a reoccurring role in J.A.G. and numerous television commercials including Direct TV that you must have seen. Shawn Arnold – The publisher of Fish Taco Chronicles, Shawn normally has one or two stories in each issue about his travels. Shawn is always shocked when people recognize him or his work which happens quite a bit more than you might think. Ken Jones – Ken is author of two award-winning books about pier fishing. He is one the most knowledgeable people in California about fishing from piers. Each issue he gives tips and insight about a different pier or region in California. Marlon Meade – Well known as the mini-jig guy you can usually see Marlon at a trade show or local tackle shop giving hints on how to catch BIG trout on little jigs. Also a Berkley and Irvine Lake pro-staffer Marlon is an eastern sierra expert. Jared Smith – SoCal Smitty as he is known on the fishing message boards is an accomplished freshwater fisherman and runs South Lake Marina in Bishop. Jared also has a book called Fishin Trails which focuses on hikes to lakes in the eastern sierra. Steve Carson – Known as the walking encyclopedia of fishing, Steve is a nationally recognized author. He writes for numerous publications in addition to being the outdoor writer for his hometown paper in Chico California. Steve mostly writes about saltwater and oft time includes an article on a recent long-range trip that he took. Woo Daves – Woo is one of the most well known freshwater bass fishermen in the world. Woo has won the BASSMASTERS CLASSIC which is the world series of bass fishing. Every issue Woo explains techniques to catch more bass in what ever season it is. Other notable writers who contribute occasionally include: Award winning photographer Dave Finkelstein, George Valenzuela, 6-Pack boat owner Bill Waddle and Mark Wisch.